INTERESTED IN CARPOOLING? Parking Services has partnered with Denver Regional Council of Governments to offer and promote the following carpooling options for Mines Faculty, Staff and Students. If the cost of driving alone to campus is hurting your budget, the Way to Go program offers relief! Way to Go matches Colorado School of Mines drivers with campus carpool partners as a way to share the cost of driving as well as on-campus parking. Once registered in an active carpool through Way to Go, all individual permits will need to be surrendered and one carpool permit will be issued and charged to the carpool group. Each registered and active carpool member with Way to Go will receive 10 free daily parking permits a year. If a member of the carpool commutes more than 10 times on his or her own, they may need to purchase a permit from one of the pay stations to park on campus. 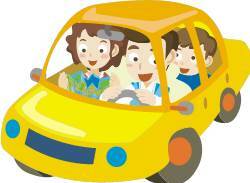 All registered carpool members can split the cost of one permit. In addition to saving money, another great incentive to join Way to Go is the Guaranteed Ride Home® which provides a free taxi ride home from the campus for employees if an emergency arises on a day alternative transportation is used. When an employee who uses alternative transportation has an emergency such as illness or an unexpected schedule change, Guaranteed Ride Home ® pays the cab fare home from the office, up to 100 miles one-way. It does not cover rides for pre-scheduled medical or other appointments, transportation due to a work-related injury, or other instances where transportation could have been scheduled in advance. Be sure to register your carpool online at www.WaytoGo.org to qualify for the Guaranteed Ride Home Program; all carpoolers must be registered to qualify for a Guaranteed Ride Home. Register with your Colorado School of Mines email address and create a trip at www.WaytoGo.org. Once registered, match with others Colorado School of Mines students and staff. Or, if you use a non @mines.edu address, go to “personal profile,” click on “network,” and look for the “Colorado School of Mines” network. Use the pass code, “CSM,” to match with potential carpool partners. Finally, contact your matches to plan your daily carpool. It’s as simple as one-two-three.